Westport, CT - Westport Historical Society invites you to toast President Washington on his 287th birthday with his favorite libation and nibbles! 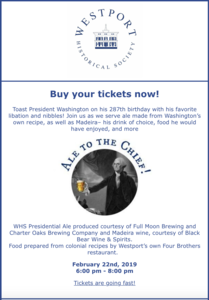 Join the WHS as they serve ale made from Washington’s own recipe, as well as Madeira– his drink of choice, food he would have enjoyed, and more! WHS Presidential Ale produced courtesy of Full Moon Brewing and Charter Oaks Brewing Company and Madeira wine, courtesy of Black Bear Wine & Spirits. Food prepared from colonial recipes by Westport’s own Four Brothers restaurant.